The history of the Montadale breed of sheep dates back to over half a century and is one of the most amazing success stories in modern sheep-breeding history. Much of the credit for the development of the Montadale goes to E. H. Mattingly, a well-known commercial lamb buyer who was obsessed with the idea of producing the ideal sheep. Early in his youth, Mattingly had been advised that if he could bring together the qualities of the big western white-faced sheep and the popular mutton characteristics of the mid-western sheep, he would be well on his way. It was sometime before Mattingly was able to begin his project, but in 1932 he drove to Kalispell, Montana, where he purchased the first Columbia ram to go east of the Mississippi River. This ram was crossed on purebred Cheviot ewes and the resulting lamb crop provided sufficient proof that his mission was on target. In order to find the most profitable combination, the sire and dam of these two parent breeds were reversed. These two crosses continued for several years with tests being made as to the growth and development of the lambs, the number of lambs per ewe., weights of the lamb and fleece weight and grade. 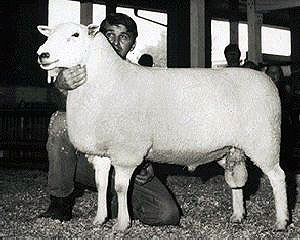 The Columbia ewe and the Cheviot ram were then adopted as the foundation for the Montadale breed and after nine years of selective culling and linebreeding, a sheep was developed that met the desired standard. 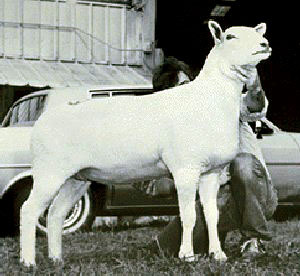 For fifteen years, many of these Montadale lambs were carcass tested for characteristics which are now the standard in the industry, but which at that time were yet to become widely accepted as the ideal . Mattingly definitely had an eye to the future in his progressive views on wool clip, growth rate, carcass quality and lambing percentage. Mature Montadale rams will normals weigh between 200 and 275 pounds (90-124 kg) and females will weigh in between 150 to 200 pounds (68-90 kg). The early results gained the attention of sheep producers as Montadales made their mark in lambing contests, ram testing experiments, and fat stock shows. In 1945, the Montadale Sheep Breeders Association was founded with five charter members. E. H. Mattingly became the first executive Secretary and Anne Gregory the secretary-treasurer. Anne Gregory, who served the association for 30 years, founded the breed's registry system. Headquartered in Plainfield, Indiana, the breed now has active producers in every corner of the country. Montadales have proven themselves in the cold upper reaches of New England, in the hot climate of the South, on the farms in the Midwest, on the ranges of the Great Plains and in the rainy climate of the Far West. The Montadale breed is considered a dual purpose breed noted for producing both high-quality carcasses as well excellent wool. As in any breed of sheep, the wool grades will vary from different parts of the country depending on the climatic conditions of the area from where they originate. Montadales will normally produce wool that grades from 48's to 58's on the spin count or 32 micron up to 25 micron range. A unique characteristic of Montadale wool is its color. Nearly all Montadale wool is extremely white in color. Montadales produce very little lanolin which makes their wool very high-yielding (45-60%). While the high yields do not affect many people with purebred Montadales, it is extremely important to the commercial producer who markets his wool on a clean basis. It is not uncommon for Montadale wool to yield 2-4% higher than wools of the same grade being produced in the same area. Montadale ewe fleeces will typically weigh from 8 to 12 pounds (3.6-5.4 kg) with a staple length of 3.25 to 4.5 inches (8-11 cm).